1 How to download videos with VidMate Apk v4.0604? 2 How to view the downloading status of videos? 3 How to speed up downloading? 4 How to view memes on VidMate Apk? 4.1 To view memes, please follow the steps. 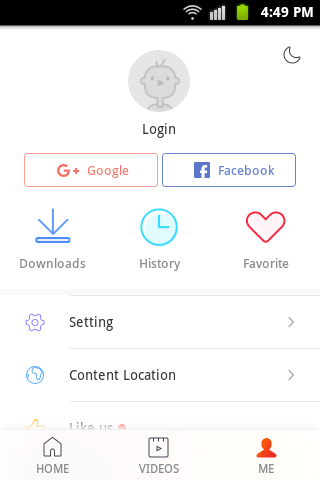 How to download videos with VidMate Apk v4.0604? 1) Launch app on your device. 2) When it opens completely, you will see a search bar at the top along with top sites below it. You can also see suggested and trending videos on your home screen. 3) Now if you want any specific video to download search for it in the search bar. 4) Now click on video title you want or tap on the download button. Then if you want to download it, tap on the red circular button at the right bottom corner as seen below. 5) Now select the quality of the video you want to download. The size of the video is shown on the side. 6) Tick on the file quality you want and tap download. Your video will be downloaded instantly. How to view the downloading status of videos? To view the downloading status, you can directly see on the notification bar. Just scroll it down and you will see there. You can tap on the video to open in the app. If you have any download running, you can see the total number of downloading videos on the top right. Tap on the icon and you will see the downloading videos. If you want to delete the video, tick the video and tap on delete. You can speed downloading speed just by a simple click. You can simply follow the following step to speed up your download speed. But before going to that, please remember that actual speed depends upon your internet speed. In some condition, the following steps work significantly while in some case it may not work. Please try this out but we cannot confirm 100% of the results. Now scroll down to find fast download mode and turn it on. You can go to a fast download option and set it to 4. Now your download speed will be significantly higher. How to view memes on VidMate Apk? In vidmate, you can enjoy a lot of memes and jokes as well as photos. It is extremely easy to use and you can easily find the memes on the app. But in case you have problems finding it or you want to know in advance how to view memes, please continue reading. Note: To view memes, you should set your location in your application to India or southeast Asia. To do this open vid mate on your phone. At the bottom of the app, you will see Home, videos, me. Go to Me tab. Now you can see the Content-location on the list of item. Tap on this option and you will see various regions to select. On this section select India and Southeast Asia. It will ask you to restart with new changes. Just tap restart and you are ready to view memes. 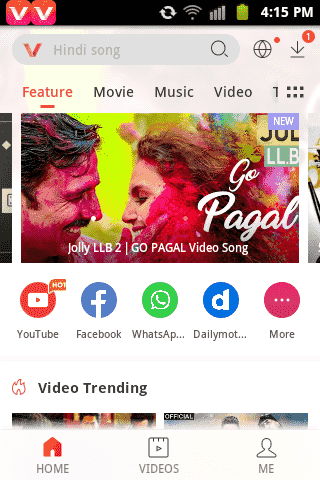 After you launch Vidmate Apk, at the top you will see “feature”, “movie”, “music”, etc. tabs. After you see meme tap on it. It may take time to load images. You can view popular or new memes as well as download the meme. To download any meme on your android phone from the app, just tap on the down sign (⇓) on the bottom-right side of the meme. You can also generate or create your own meme and be popular. You can also upload meme anonymously-meaning nobody will know you have uploaded it i.e. your identity is hidden. In the meme tab, you will see a “make a meme” button. Tap on it. Now you can either take a live picture to make a meme or you can choose an existing picture from your gallery to get started. After you choose the picture there are various options available to edit the photo. You can add text, change brightness and other options to make your meme more interesting. After you finish your work, you can finally upload your meme and make it available for the world to see. With the same internet connection, VidMate Apk provides up to 200% faster speeds than similar other apps. It uses an advanced technology that helps you to get the maximum capability of your internet speed. What it does is that it connects to the host multiple times from your single device which can improve your internet speed up to 5 times. You may think that this is not new technology, several other apps are already doing it. We agree. We are actually not doing a different thing, we are doing things differently. In simpler words, we are using similar technology but improved one. This app provides a lot of features which is obviously difficult to manage but we have done it beautifully and systematically which doesn’t only make it easy to use but also makes it extremely beautiful to look at. So, even a first time user can easily use it and get used to it. Moreover, we are providing you with a complete guide on using it which should help you a lot on using it if you are new to it. There are many apps that claim to provide live TV channels but it’s sad to know that most of them are fake or require money to watch. We are introducing you to a unique feature to watch more than 200 live TV Channels, covering Movie, Music, Fashion, News, Entertainment, Sport, and many other kinds of channels. This is one of the features which you may never be able to find in other apps free of cost. Those TV channels load faster so that you can enjoy free live TV channels even on the slow internet.